My name is Cara McGrath and I live in Gloucester. 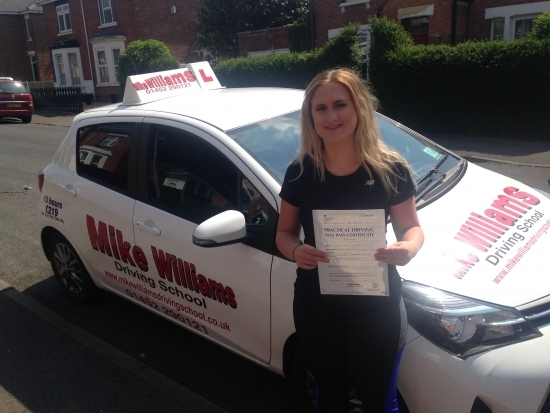 I chose Mike Williams as my driving instructor because his website was really useful and I could tell that Mike enjoyed his job and was passionate about it! I found his contact number on his website, and I was really happy with the quick response I got. As I have had a previous Instructor I was worried that the learning to drive experience would be the same, but it was a lot better than I expected and very happy that I swapped instructors. He made me feel so confident! Mike´s teaching methods are very calm and he explains things simply(in a good way) so you can understand what he is trying to say, it is so nice that he is so chilled as that made me feel relaxed and steady. Would I recommend you to my friends and family? That would be a Great Big Yes! Couldn´t have asked for a better driving instructor so I will definitely recommend to others! Honestly can´t thank him enough for giving me the confidence and push that I needed! Also still shocked that I passed! Thank you for being so lovely and chatty!